The Canal Race has been held since 1998, and is an out and back route following the canal from behind the New York Stadium, out towards Meadowhall with the turnaround point just after the HalfPenny Bridge, Tinsley, before heading back to Rotherham and the finish line. The 5 mile route was, for the most part until 2012, all firm trail and took in a circuit of Blackburn nature reserve but with tarmac being laid along the canal towpath from Rotherham to Meadowhall in early 2013, future races have no need for trail shoes! As you can imagine, with a route that follows the canal, the only ‘climbs’ are alongside two locks along the route meaning a total elevation gain of just 40m across the whole 5 miles. Aaron Larkin from Rotherham Harriers & Athletics Club was the race winner in 28 mins and 40 seconds. First lady home was Lindsy Jamesfrom Kimberworth Striders who finished in 33 mins and 12 seconds. Our own Sarah Allcard won the V45 category to add to her growing list of accolades! 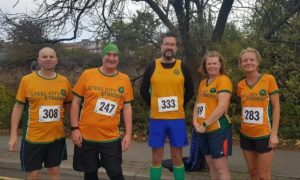 161 runners entered the race, seven of which were Steel City Striders.